EMSB officials and Physical Literacy ambassadors gather after the press conference. PRESS CONFERENCE: On the eve of Kindergarten and Elementary School Registration Week (February 4 to 8), the English Montreal School Board (EMSB) showcased its programs that support the development of physical literacy. 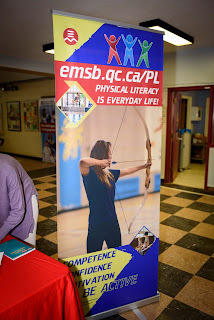 Special guests, media and small contingents of students from six EMSB schools were invited to Hampstead Elementary School on January 25 to learn more about physical literacy through numerous activities and presentations on the subject. Hampstead School is one of the elementary institutions which has assumed a leadership role in this area. EMSB mascot Bumble gets into the exercise theme. Physical literacy is about developing the competence, confidence and motivation to be active in a variety of ways and environments. The idea is that by being confident in physical activity, students benefit in their overall physical, mental and emotional health. Physical Education plays a critical role in developing physical literacy – in Phys. Ed. 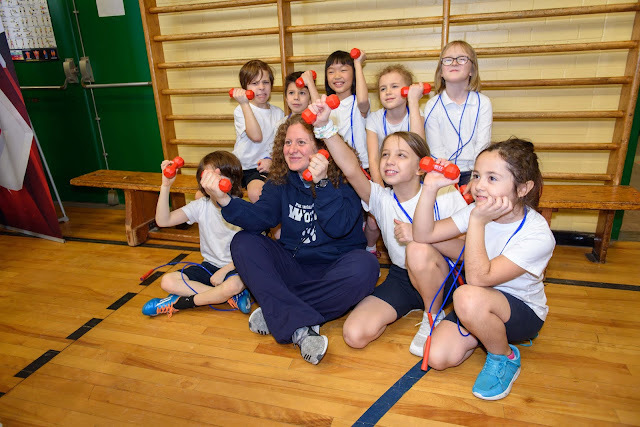 classes, students develop their movement competence, and Physical Education teachers are also careful to structure their classes to encourage confidence and motivation, two important components of physical literacy. The benefits of regular physical activity are already well documented: sustained long-term health, increased social connectedness, improved general mental and physical well-being and better quality of life. But children who are more physically literate have more access to these benefits, which is central to their success as students. You can also go to www.emsb.qc.ca/fl to read all about this initiative. The Pierre Elliott Trudeau School delegation. 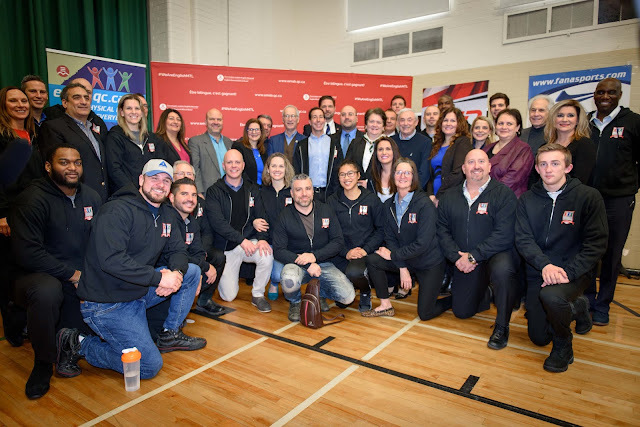 VISITING SCHOOLS: Students and staff from Royal Vale, Elizabeth Ballantyne, Parkdale, East Hill, Pierre Elliott Trudeau and Pierre de Coubertin Schools were on hand and took part in the launch. The Gazette's Stu Cowan talks to Kavis Reed, Rick Green and Kim St. Pierre. William Stanback and Jean-Gabriel Poulin along with Amy Walsh visit a Kindergarten class. Champions for Life Program Director for English Schools, Joanne Lawson; a student supervisor at John F Kennedy Adult Education Centre in St. Michel, but well-known as a former professional basketball player in Europe and a member of the Canadian Olympic mens basketball team in the Seoul Summer Olympics, Dwight Walton; a former student at Elizabeth Ballantyne Elementary School in Montreal West and at age 71 the 16th person to climb the highest volcano on every continent (he may now be recognized by Guinness World Records as the oldest person to climb both the Seven Summits and the Volcanic Seven Summits), Ted Fairhurst; the commander of local police Station 9 and a one-time offensive guard for the McGill Redmen football team, Luis Oliveira; a former Gerald McShane Elementary School student, who now plays forward with the Junior AAA Montreal North Arctic, Elio Dimeo; a former professional hockey player and currently a colour commentator for Laval Rocket broadcasts on TSN 690, JP O’Connor; a former midfielder for the Canadian Women’s Soccer Team and a member of the Canadian Soccer Hall of Fame, Amy Walsh; a Grade 10 student from LaurenHill Academy and elite wrestler with his sights set on the Summer Olympics, Nolan O’Rourke; and a former professional basketball player and a member of the Phys Ed staff at Hampstead School, Shawn Brown. Shawn Brown and some of his students. 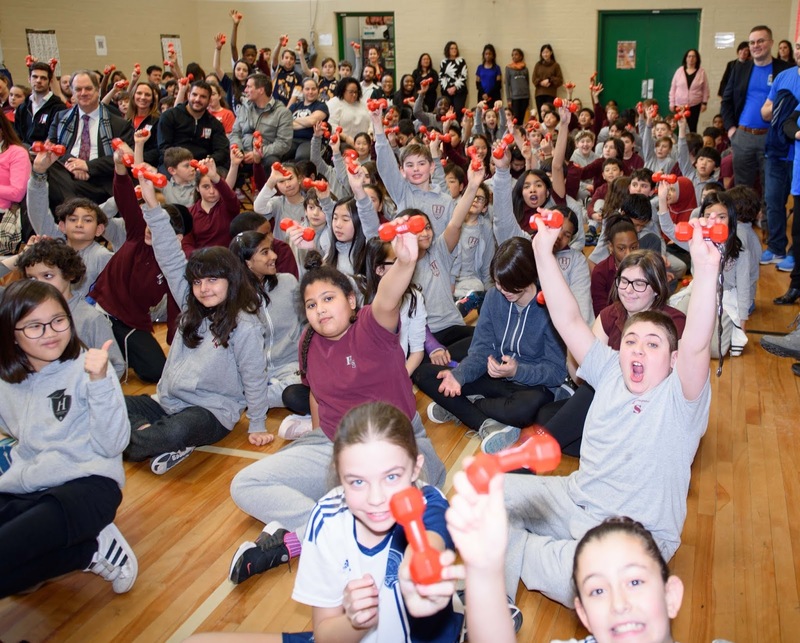 HAMPSTEAD THRIVES: Hampstead Elementary School was the site of a whirlwind and active day January 25 at a press conference by the English Montreal School Board (EMSB) showcasing physical literacy. 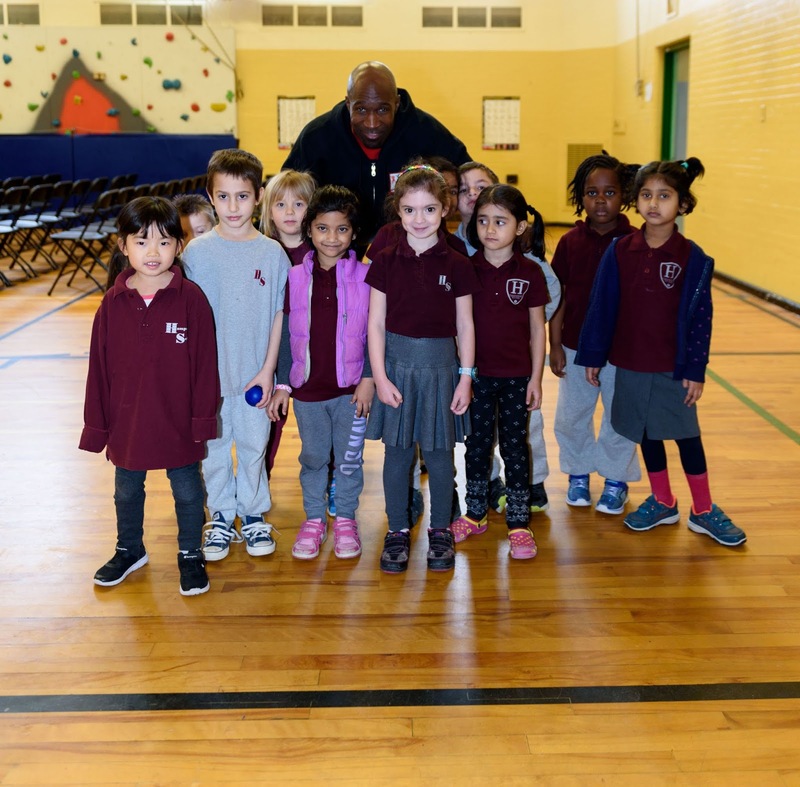 Chosen to host the event, Hampstead School is a leader in developing physical literacy among its students through various physical education and physical activity-related programs. The school is providing creative and simple ways to allow for and encourage the natural inclination of children to move. Principal David Lee, a keen supporter of outdoor activity, says the school is providing more and more ways to incorporate movement in the everyday life at school. Beyond the Physical Education and Health (PEH) classes offered as part of the curriculum are creative ideas such as “brain breaks,” which are sunshine-yellow plastic boxes affixed to hallways walls that contain a game or activity. One student or a pair can ask for a 10-minute hallway pass from their teacher, which gives them permission to leave the classroom and do something active in the hallway. The boxes can contain a soft football or soccer ball for a passing game. Providing the freedom to get up and move “can help a child reset,” says Mr. Lee, allowing them to return to class refreshed. SPECIAL NEEDS: The EMSB strives to support the development of physical literacy for all students, no matter what challenges they face. Physical literacy is a journey upon which children and youth, and everyone, develop the knowledge, skills and attitudes they need to enable them to participate in a wide variety of activities. From Mackay Centre School students that have motor, language and communication disorders, and those that are Deaf and use American Sign Language to communicate, to Philip E. Layton (PEL) School students that have many of these same issues in addition to visual impairments, or students with autism and intellectual difficulties that attend many EMSB Schools, the Physical Education and Health teams are adapting their programs to focus on the abilities of their students as they progress along their individual physical literacy journeys. Students display their Physical Literacy foam barbells. GMAA PARTICIPATION: A total of 242 EMSB teams are participating in the Greater Montreal Athletic Association’s (GMAA) sporting events this school year, and students are reaping the benefits both in and out of the classroom. The GMAA is dedicated to the belief that sport is a key educational tool, helping young people grow physically, emotionally and intellectually. The EMSB is committed to this belief as well. The GMAA is a school sports organization devoted to the promotion of athletics in English schools of the Greater Montreal region. An affiliate of Réseau du sport étudiant du Québec (RSEQ), GMAA organizes over 30 sporting activities during the school year, serving 60,000 students in elementary and high school. The GMAA coordinates three scheduled sport seasons (Fall, Winter and Spring). This gives high school students from the EMSB, Lester B. Pearson School Board, and 23 private schools in the Greater Montreal area the opportunity to try a new sport each season, learn a varied skill set, and have multiple experiences in a team setting. Ryan Oxley from the B.A.S.E. 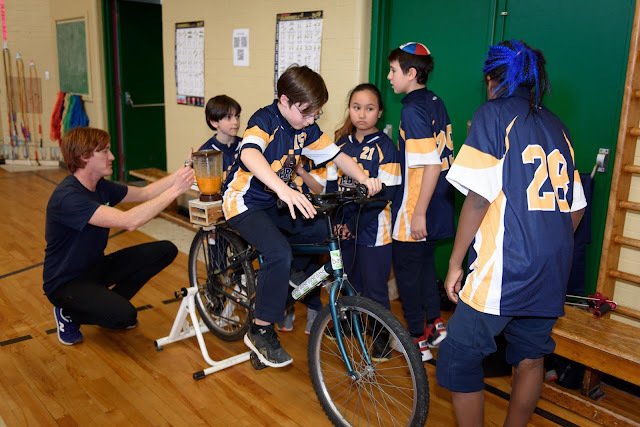 Program shows some students how to operate the bike blender. BIKE BLENDER: This academic year, the B.A.S.E. Daycare Program has introduced two Bike Blenders into its stock of equipment to service our schools. The EMSB Before and After School Enriched (B.A.S.E.) Daycare Program is excited to introduce Bike Blenders into schools on a rental basis. The bikes have been modified to propel a blender that can make simple smoothie recipes. Students will have the chance to pedal a bike and blend their own smoothie while also creating their own recipe. It is an excellent tool for educators to use in animating activities with their students as part of Pedagogical Day activities, Harvest Parties, school events and fundraisers. The Bike Blenders provide opportunities to increase educational competencies while engaging students in a positive social experience. 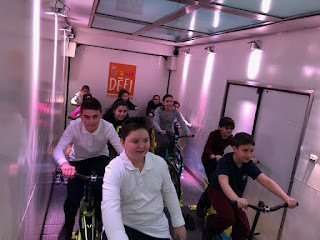 In particular, Bike Blenders are an excellent tool to use in teaching children about Nutrition, Physical Education and Health and STEAM (Science, Technology, Engineering, Arts and Mathematics). The Bike Blender can be used as a tool for highlighting nutrition through creating healthy snacks. It was a big hit at the Physical Literacy launch. .
John Pevec and his former student Joey Alfieri. 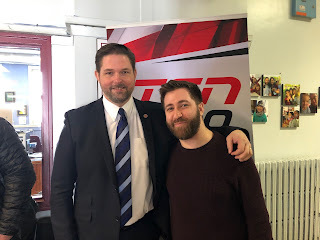 LIVE BROADCAST FEEDS: Vincent Massey Collegiate graduate Joey Alfieri broadcast live interviews from the the press conference on TSN 690 and CJAD 800. Mr. Alfieri had a chance to engage with Regional Director John Pevec, who was his vice-principal when he attended VMC. Here is the TSN 690 commercial that ran in advance. CBC RADIO ONE: Shawn Appel of Radio Noon on CBC did an entire program on the press conference and theme. Please give it a listen here. 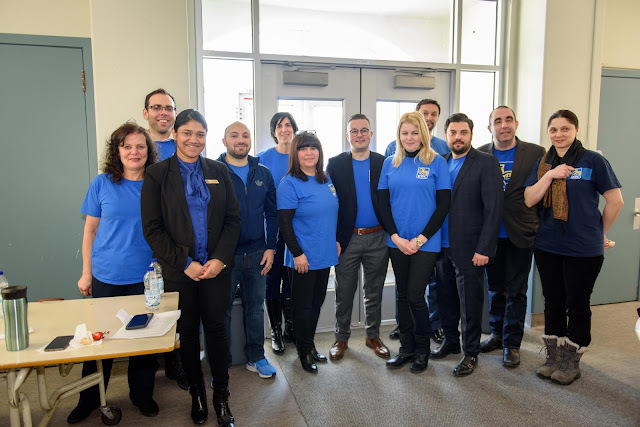 RBC VOLUNTEERS: A thank you to Marisa Volpe and her team at the Royal Bank for providing volunteers for the press conference and for sponsoring the lunch. The RBC staffers, many of them bank managers, executives and financial planners, greeted guests and facilitated classroom sessions. It is all part of their mission to become involved in the community. ELEMENTARY SCHOOL REGISTRATION WEEK: Elementary School Registration Week for the 2019-2020 academic year will take place from Monday, February 4 to Friday, February 8. If one child from a family is already enrolled in a particular school, a sibling registration period will take place a week earlier. 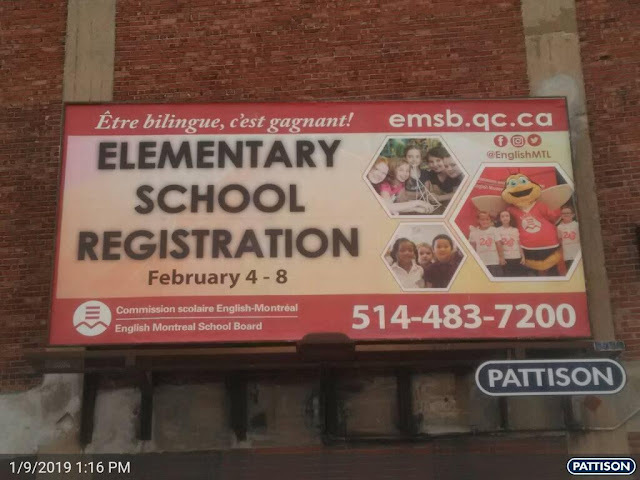 Parents are asked to register at the EMSB elementary school nearest their residence offering the French program of their choice. For more information please call (514) 483-7200, extension EMSB (3672) or log on to the Board’s website at www.emsb.qc.ca. All pupils registering for the first time are required to provide a birth certificate and vaccination records to the school the child will be attending. Parents will be asked to fill out forms which will allow the school to apply for the certificate of eligibility for English schooling. Under the Charter of the French Language, a certificate of eligibility is generally granted to children who did the majority of their elementary or secondary studies in English in Canada; whose mother or father did the majority of his/her elementary studies in English in Canada or whose brother or sister did the majority of his/her elementary or secondary studies in English in Canada. As a result of language legislation, this criteria excludes studies completed in the Quebec Private School system. TV COMMERCIALS: This commercial promoting Elementary School Registration Week, has been airing on CTV Montreal. The production took place in November at Royal Vale School, where the entire K to 11 experience could be caught on camera. The EMSB will also have this advertisement running on CTV. Here is the commercial on Global TV, recorded at Roslyn School. PROMOTIONAL BILLBOARDS: Seventeen promotional billboards now appear all over our school districts promoting Elementary School Registration. Here are all of the billboard locations: Laurentien Boul. (Rte 117) and Gouin Boul. West; L’Acadie Boul. and Chabanel St.; St-Michel Boul. and Port Royal St.; Côte-des-Neiges RD and Chemin Bedford; St-Jacques St. and Old Orchard Ave.; Somerled and Cavendish; St-Jacques St. and Melrose Ave; Van Horne Ave. and St. Laurent Boul; Wellington St. and Butler St; Saint-Patrick St. and Laprairie St; Souligny Ave. and Desautels St.; Notre-Dame St. East and Rougemont Ave.; Rivières des Prairies Boul. and Martinière St.; Autoroute 15 and Henri Bourassa Boul; Henri Bourassa Boul. and Autoroute 13; Boul. Pie IX and 47th St; and St-Michel Boul. and Charland Ave. OUTSTANDING PRINCIPAL: While Michelangelo International Elementary School in RDP might be tucked away at the eastern edge of Montreal, Principal Marisa Mineiro will soon be thrust into the national spotlight as she was recently named as one of Canada’s Outstanding Principals. The announcement was made by the Learning Partnership. Overall, 30 educators across the country were chosen by The Learning Partnership as Canada’s Outstanding Principals of 2019. This marks the sixth time that an EMSB educator was amongst those chosen. 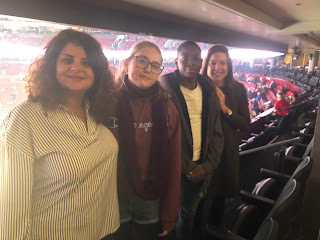 Ms. Mineiro follows Lester B. Pearson High School’s Joseph Vitantonio (2018), Pierre Elliott Trudeau Elementary School’s Anna Sanalitro (2017), Westmount Park Elementary School’s Marylene Perron (2016), retired principal Claude Dansereau (2015) and LaurenHill Academy’s Donna Manos (2011) as winners. Ms. Mineiro has been an administrator at the EMSB for seven years, the last three at Michelangelo International Elementary School. Her first foray into administration came under Ms. Manos at Honoré Mercier Elementary School in St. Leonard. Her full-time teaching career began in 2002 at the former Frederick Banting Elementary School before moving to Michelangelo from 2004 to 2012. 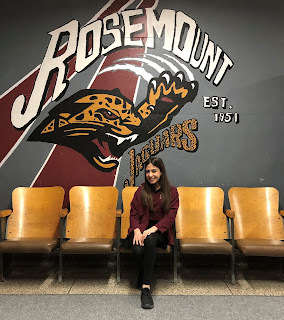 SINGING CHEF: Samantha Calabrese also known as local television’s “The Singing Chef,” is a 14 year old Secondary III student at Rosemount High School. Samantha always dreamed of being on television and when she won the contest Cook for a Cure, everything fell into place. On May 10, 2017, Samantha presented her dish at the Cook for a Cure event organized by Spiritual Animator, Vince Lacroce. Alongside her godfather, the poached pear dish won dish of the night! The prize was to appear on Breakfast Television, but little did she know it would be the start to much more! Samantha has been cooking since the age of two and continues to do so at home with her mom and family. While on the show, she was asked if she had any other passions other than cooking. Singing was one of them and she was asked to do a presentation. She proceeded to sing Rolling in the Deep by Adele. That’s when her singing talent was discovered and she earned the title of “The Singing Chef.” Although she loves cooking, singing is her passion and this began because of her sister who also likes to belt out a tune. She loves music from previous generations such as Michael Jackson and The Beatles. Samantha is a natural born star, she loves being on television and for her it comes so naturally. See our full story. Here she is on Breakfast TV. ANNUAL REPORT: Article 220 of the Education Act requires each school board to report on its partnership agreement in its Annual Report. The EMSB Partnership Agreement Annual Report informs all of its stakeholders in its territory with an account of the implementation of its strategic plan and the results obtained with regard to the goals and measurable objectives set out in the partnership agreement that was entered into with the Minister of Education on July 1, 2010. The annual report informs the reader of the board’s objectives and targets set, the context as to why they were set, the results obtained, the board’s interpretation of the results, and the adjustments or corrective strategies to be implemented as a consequence of the results. The report also analyzes the degree of success of the strategies employed and their contribution to the attainment of the objectives. This allows the Board to identify strategies that are less effective and need to be modified or discontinued. Where there is insufficient progress, the board re-examines once again its educational and organizational practices and determine what new strategies should be developed to increase student success. This is the last year for the report on the Partnership Agreement. As of next year, the board will be reporting in a very similar way on its Commitment to Success Plan. A formal presentation of this documentation was made at a public meeting on January 10. RELOCATION AND FRANÇAIS PLUS: The EMSB will proceed with the relocation of students from Westmount Park Elementary School for two years to Marymount Academy International in NDG and the former St. John Bosco Elementary School in Ville Émard. Meanwhile, plans to create a new Français Plus primary school in NDG has been delayed in order to consider another option for the intended facility. Westmount Park Elementary School will undergo major renovations. Due to the scope of the $12.5 million project, this will require that the entire school population be relocated for the 2019-20 and 2020-21 academic years. The more than 700 students will be split between Marymount and St. John Bosco and both sites will have Pre-K to Grade 6 levels in order to not separate siblings. With West End elementary schools bursting at the seams in terms of enrolment, the EMSB Long Range Planning Committee had originally proposed the opening of a brand new Français Plus primary school at 4850 Coronation Avenue in NDG. The specific over-crowding of immersion schools in this area extends to Edinburgh (127 percent capacity) in Montreal West, Merton (107 percent capacity) in Côte Saint-Luc and Willingdon (90 percent capacity) in NDG. In order to accommodate the new school, the EMSB had recommended that two alternative high schools – Focus and Outreach – have their population relocate to the James Lyng High School facility in St. Henri. The latter presently has a lease with Centennial College, which concludes on June 30, 2019. The Council of Commissioners has accepted a new proposal from Long Range Planning for one of the schools experiencing overcrowding (Edinburgh, Merton or Willingdon) to take over the Coronation Avenue facility as a Junior campus (Pre-k to Grade 2) in order to immediately alleviate overcrowding in their own school and in the other two West End schools. In addition, the school that takes over the building as their Junior campus could also offer the Français Plus Program. The first Français Plus immersion program would operate from Kindergarten to Grade 4 (instead of from Kindergarten to Grade 2) and 50 percent- English and French - in Grades 5 and 6. See the full story: http://www.emsb.qc.ca/emsb/articles/special-board-meeting-to-decide-upon-francais-plus-school-in-ndg-and-relocation-of-westmount-park-elementary-school-students. A decision will be made at a special board meeting on February 20. See this report on Global TV. OUT OF THIS WORLD PODCAST: On a recent EMSB podcast, Barry Morgan spoke with EMSB robotics consultant Sara Iatauro and aerospace educator Brian Ewenson, who visits EMSB schools as a guest speaker. Ms. Iatauro was the chairman of the RoboCup International Competition and Symposium held in Montreal this past June. 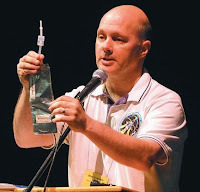 Mr. Ewenson is a rocket scientist, astrophysicist and an elementary school teacher. He's worked with almost all of our top Canadian Astronauts. Together, they discuss space exploration, robotics and what the near future could look like. Here it is . We would like to thank Barry for his service. He has now accepted a position in the public health system. We will introduce our new podcaster shortly. Mike Cohen with The James Lyng delegation. 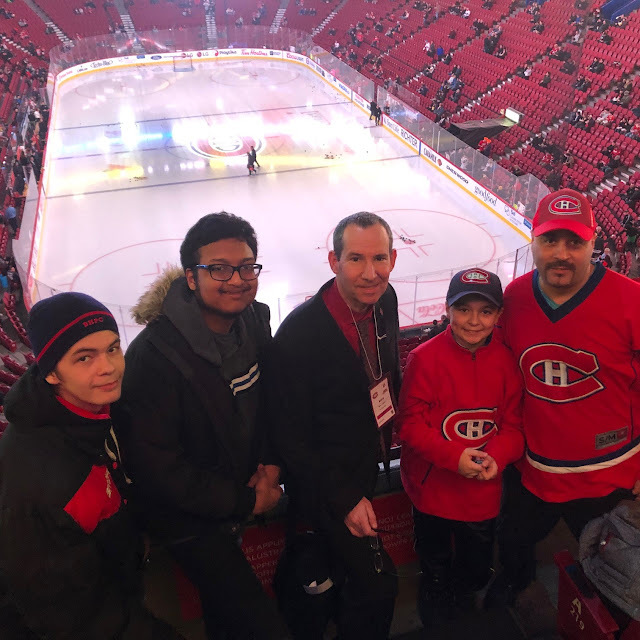 STUDENTS CHEER ON HABS: For the Montreal Canadiens game on January 23 at the Bell Centre vs. Arizona, the EMSB was fortunate to receive some generous donations of tickets. Coach Norman Katz and his team. 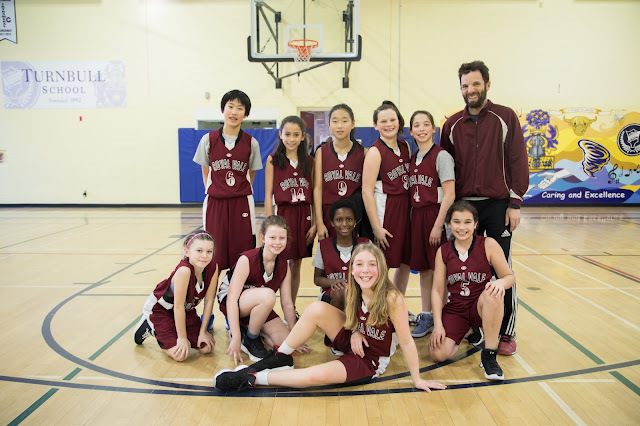 BASKETBALL TEAM SETTING RECORDS: The girls basketball team at Royal Vale School is setting records, as they’re closing in on their second straight undefeated season. RVS finished their 2017-18 season 20-0 and so far, are off to a 10-0 start in their 2018-19 campaign. "What impresses me the most is how humble they are," said head coach Norman Katz. "Congrats to our leaders Jaime and Melissa who lead the team on and off the court." Julian Haber Photography for the picture. Corey Fleisher is warmly greeted. 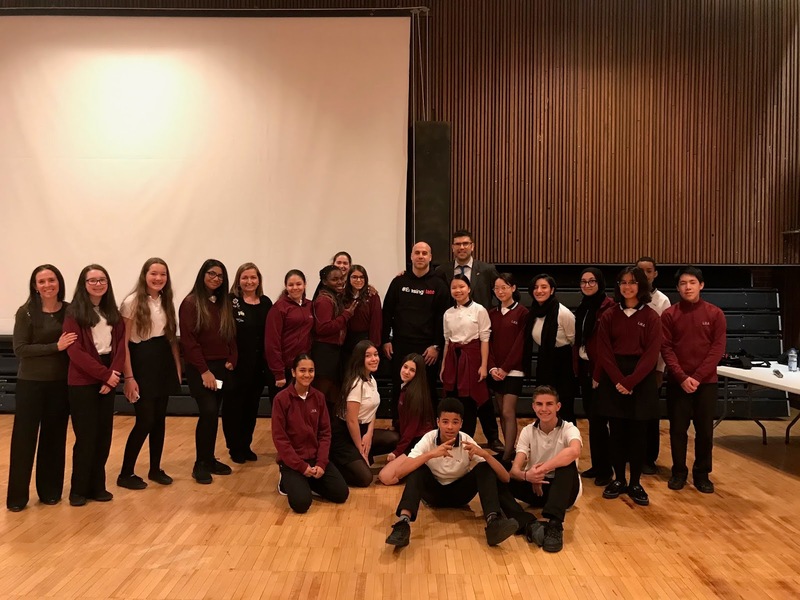 ERASING HATE: Corey Fleisher brought his #ErasingHate message to LaurenHill Academy Junior Campus recently, inspiring students with his incredible work to rid Montreal and the world from hate-filled graffiti and messages. Fleisher spoke to students about his journey from elementary school and how a chance drive down Monkland Ave. led him on the path to becoming a world renowned figure, spreading his message of tolerance and positivity. SUBSIDIES FOR JEWISH CAMPS: Jewish overnight camp gives kids the chance to explore their connection to Judaism in a meaningful way, all while having the summer of their lives! 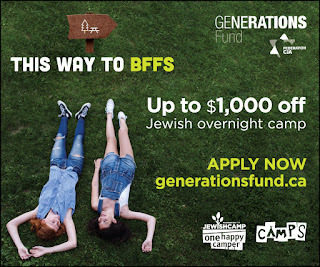 Thanks to Federation CJA’s Generations Fund Camp Initiative, your child may be eligible for up to 1000$ off Jewish overnight camp. Simply fill out the application form at www.generationsfund.ca to find out if you are eligible. Many EMSB families in the past have taken advantage of The Generations Fund Camp Initiative. It was created to help children in Montreal experience the transformative impact that Jewish overnight camp can provide by offering grants, multi-year subsidies, and incentives to families in our community. 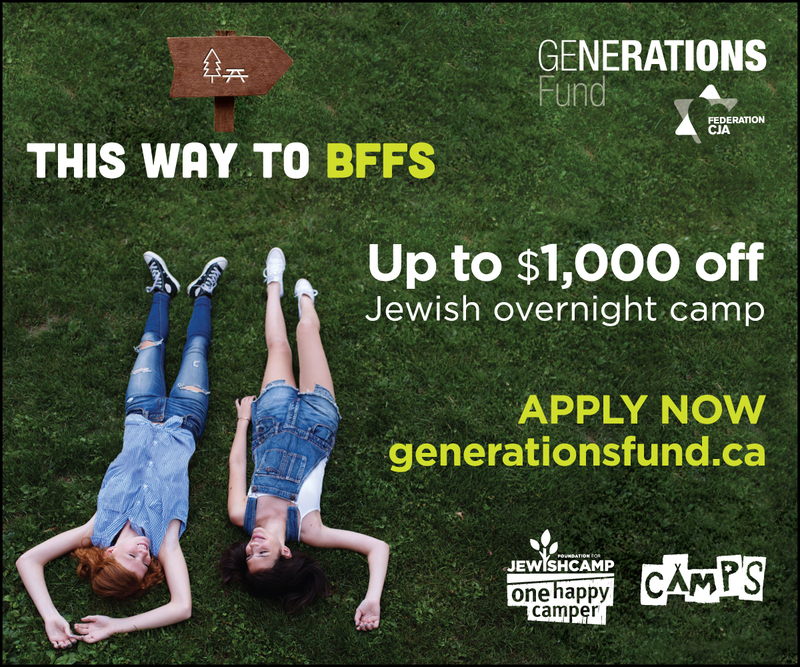 Check out the One Happy Camper first-time camper incentive grants, as well as Federation CJA’s CAMPS Access Grants designed to make Jewish camping experiences accessible to more children in our community. See the complete story here. For all other questions, please contact info@generationsfund.ca, or log on to www.generationsfund.ca. 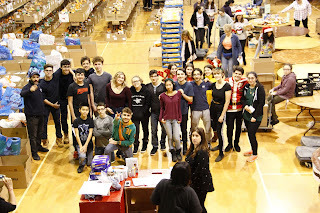 FOOD COLLECTION: During the month of December, Vincent Massey Collegiate students, many from the Spiritual Care and Guidance and Community Involvement Animation “Be The Change” Committee, gave up their day off from school to volunteer at St. Brendan's Food Bank. They prepared over 240 food baskets that included both perishable and nonperishable items and over 400 personalized new presents for needy families in the community, many who have children that attend EMSB schools. A good portion of the students also volunteer their time on a monthly basis to aid with the food banks BROWN BAG project. This is all part of VMC's S3 S.H.A.R.E. initiative. Spiritual Care and Guidance and Community Involvement Animator Rocco Speranza noted that, “This type of activity allows our students to see where their donations go, and provides them with an opportunity to spend time with community members. It is more than just dropping off nonperishable food items in a donation box at school. Through this activity, they become more aware and more connected to the issues that community families face and deal with on a daily basis. Volunteering and helping made everyone feel the importance of this SEASON of LIGHT and JOY. .
WEBSITE CHANGES: Changes on the EMSB Website have been made concerning the news, check out our new layout! Our News Archives is now called “EMSB News Headlines” which can be found on the Parents & Community drop-down menu. Westmount High students have some fun. WACKY OLYMPICS: Westmount High School held their very first Wacky Olympics 2.0! This event was held for the Leaders on Wheels, Mackay’s Satellite class at WHS involving students in wheelchairs. Jana Lawlor, currently a Secondary IV student at Westmount High School, is the brains behind this operation. Alongside C.J. 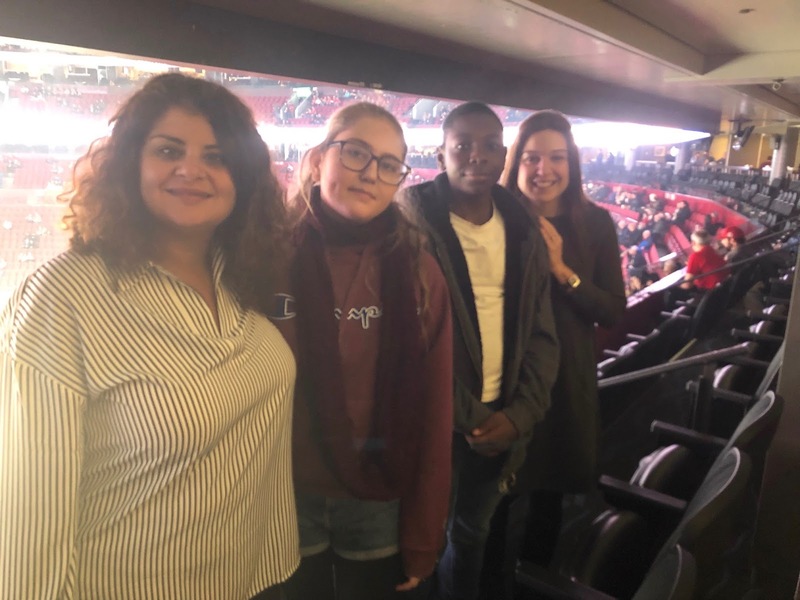 Turner (Staff Head of Student Council), Rose Sondola (teacher) and 20 some students from Student Council and the Leadership program, the seven Mackay students had a great time! Seven rotating activities were prepared which were all going on simultaneously. Close at hand with the “Best Buddies” chapter, the helpers assisted in cheering them on and were present in case of assistance, but these activities were adapted to the various need of the students so that they could perform on their own. 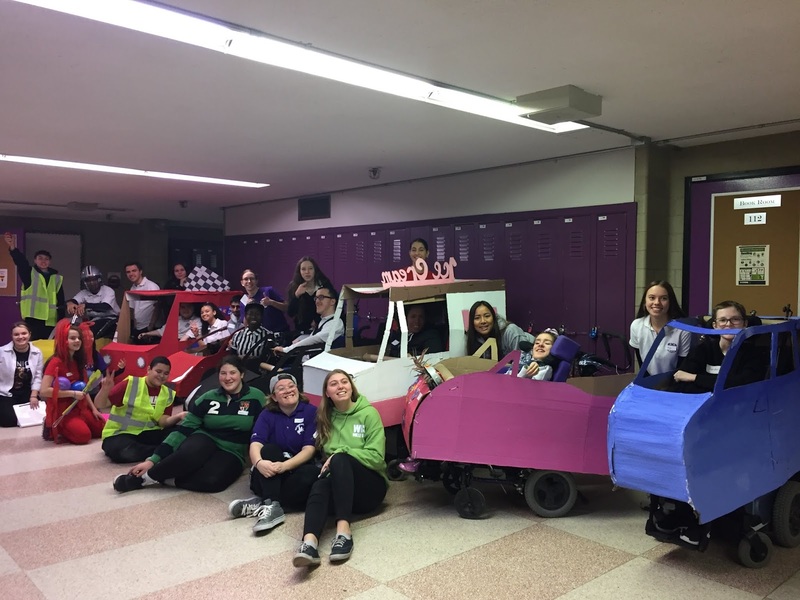 Mackay adults and students made the cars during art class, which would eventually be placed over the wheelchairs. They had been planning this since the end of November 2018 and had been working extremely hard since the return of Christmas break. CHEERS TO VOLUNTEERS: The EMSB will hold its annual Parent Volunteer Appreciation Evening on April 9 at Plaza Volare. Those individuals who have volunteered for five years or more will be among the 500 people invited. ``Cheers to 20 years of Volunteers” has been chosen as the theme. MENTAL ILLNESS INITIATIVE: Rosemount High School will be embarking on a new mental illness initiative called ¨Small Talk, Big Result¨. The intent of program is to engage students in an open discussion about mental illness, offering new ideas, eliminate the stigma of mental Illness, and hope for those who may be struggling. The initiative will be spearheaded by Spiritual Community Animator Vince Lacroce. The launch of the program will be on February 7, with a candid two-part interactive presentation called “Life after Addiction: A Story of Perseverance.” Youth Intervention Worker Gerry Tullio, alongside Mr. Lacroce, will share Mr. Tullio’s story of addiction and overcoming his battle of mental illness. The follow-up session will consist of a presentation from Laurie Baum, Youth Counsellor at Chabad Lifeline, who will address the importance of defining mental illness triggers and ways to obtain support. This month long initiative will be culminated by an informative presentation from the Partners for Life Foundation. The aim of their program is to prevent psychological distress in adolescents. Students will have an opportunity to sign up for two presentations: "Depression is reversible," which educates young people aged 14 and older about depression and their new pilot project which will promote good mental health among students in Grades 7 and 8. ANIMAL WELFARE CONFERENCE: The 2019 National Animal Welfare Conference is happening at the Hotel Bonaventure Montreal April 14-15, 2019. Conference registration will open in December 2018. All two-day conference registrations come with 1 ticket to the Opening Social on April 13 and 1 ticket to the Animal Welfare Leadership & Innovation Awards on April 14. All conference and training day registrations include breakfast, lunch and nutritional breaks for the day(s) you have registered. EARLY BIRD RATES, Until January 31, 2019 $330: Two-day conference registration (Humane Canada members and students).$385: Two-day conference registration (general attendee). More info here. ENGAGE: Students from Royal West Academy spent 10 hours at the Montreal SPCA working with animals waiting to be adopted. As part of their extra-curricular program hours, the students learned about animal welfare and carried out projects in the shelter which provided mental stimulation to cats, dogs and small mammals such as rabbits and guinea pigs. Youth programming at the Montreal SPCA is offered by ENGAGE: Animal Welfare Education, a non-profit organization dedicated to building empathy among youth. To request a Montreal SPCA youth program for your students, contact: Colleen Ovenden, 514-999-9465, colleen@engageanimal.org. As promised, attached is a text and some photos of our RWA program for the next edition of the EMSB Focus Newsletter. As well, here is a Facebook link to the album of photos. COLLECTION: Before the holiday break, many students were busy as can be. Under the guidance of Spiritual Care & Guidance & Community Involvement Animator Rocco Speranza, several schools, Edward Murphy, East Hill, Mountainview and Vincent Massey Collegiate, collected thousands of hats, mitts, scarves, blankets, shoes, socks, soaps, and tooth brushes. As well, they made over 800 holiday cards for Montreal’s homeless as part of the, “Baby its Cold Outside” and S.H.A.R.E. The Warmth projects. 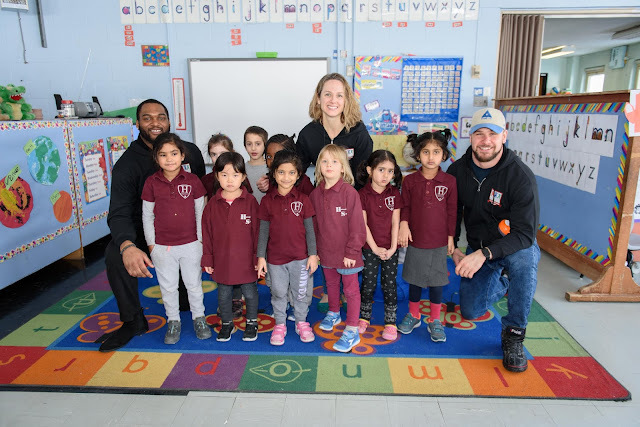 In addition, the Pre-K and Kindergarten students from Our Lady of Pompei BASE Daycare Program, with Pia DiBacco, Agatina Nicita, and supported by School Principal Steven Rebelo, Jenna Tafuto, and Secondary IV students Celo and Julien from VMC, were busy as bees creating pure sweetness. They worked on their community service project entitled, "Pay it Forward: Hope for the Homeless the Gift of Giving.” They created over 70 Peace Canvas Bags (filled with socks, toothpaste, toothbrushes, and soap). An alumni of Our Lady of Pompei School, Jenna Tafuto, has been helping out with this project for years. “Children are a bright light in the world,” noted Mrs. Pia and Mr. Speranza. The S.H.A.R.E. (Spreading Hope, Acceptance, Respect, and Equality) campaign came to be several years ago. Students worked hard not only to collect new socks, scarves, shoes and snow boots, they also came together on the weekend of December 22 to prepare and deliver over 1200 meals to the city's homeless. They worked with other community groups such as the Knights of Columbus and Cents of Hope. As Ms. Pia noted, “Creating awareness -well tis the season for caring acts of kindness.” By sharing, we help others, we help ourselves, and we make a difference. SPIRIT OF GIVING: During the week of December 10, St. Dorothy Elementary collected in style for the Spirit of Giving canned food drive. Coordinated by French Language Arts Teacher Sandra Gloria, English Language Arts Teacher Katia Lyng, and Child Care Worker Marco De Crescentis, each day of the week featured a different food collection event. On Monday, they hosted a Grandparents Day where grandparents were invited to take part in games and decoration activities for the price of one food item. On Tuesday, they organized a Spirit of Giving ceremony which explained where the food was going and who it was helping. On Wednesday, students created cards for patients at Sainte-Justine Hospital. On Thursday, a hockey tournament took place and on Friday, the students designed ornaments that reflected what giving truly means. As well, each classroom took part in a food collection competition. All of these fantastic events truly paid off as over 20 boxes of food items were collected for the needy. 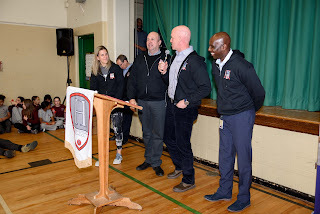 ARCTIC VISIT: Four players from the Montreal North Arctic, along with team vice-president Lina Di Giovanni and marketing director Alexia Perretta , visited General Vanier Elementary School in St. Léonard. Cedric Lariviere, Christiano Paterno, Felix Bouchard and Benedic Jobin spoke to the students about staying in school, answered questions and played a friendly scrimmage against the Grade 6 students. General Vanier scored a surprising 7-6 victory, delighting Principal Joe Schembri and physical education teacher Francesa Acuri. General Vanier students were given tickets to an upcoming Arctic game at the Garon Arena. VIRTUE OF GENEROSITY: Practicing the virtue of generosity during the month of December, students at FACE Elementary School and Lauren Hill Academy (LHA), joined forces to bring some warmth and comfort to the young patients at the Montreal Children’s Hospital during the holidays. Lauren Hill students volunteered to sew pillows under the guidance of LHA Special Education Technician Glendora Sealy, while the Grade 1 and 2 English classes at FACE, under the guidance of Spiritual and Community Animator Elizabeth Pellicone, wrote individual cards expressing their empathy towards the sick children living in the hospital during the holidays. The pillows and cards were dropped off, and, consequently, the students did not receive any direct communication from the children recipients at the Children’s Hospital. As a result, Lauren Hill and FACE students were fulfilling an act of generosity by giving to others without reciprocity. The students came out of the activity feeling good, helping their community with no expectations; instead, acting simply for the sake of being kind. LaurenHill students are welcomed to Chez Doris. HELP A SISTER OUT: The Small Acts/Big Impact club at Lauren Hill Academy (senior campus), ran a campaign called “Help a Sister Out!” where the club held a bake sale and asked students and staff to bring in gently used women’s clothing. The clothing was sorted and exchanged for cash at the consignment store, Empire Exchange. The money raised (108$) was donated to Chez Doris, a women’s only day center located downtown. They provide therapeutic counseling, financial planning, free clothing and toiletries, food baskets, medical services, daily meals and opportunities to socialize and rest. The money raised by the bake sale $35 was used to purchase deodorant for Chez Doris’ clients. 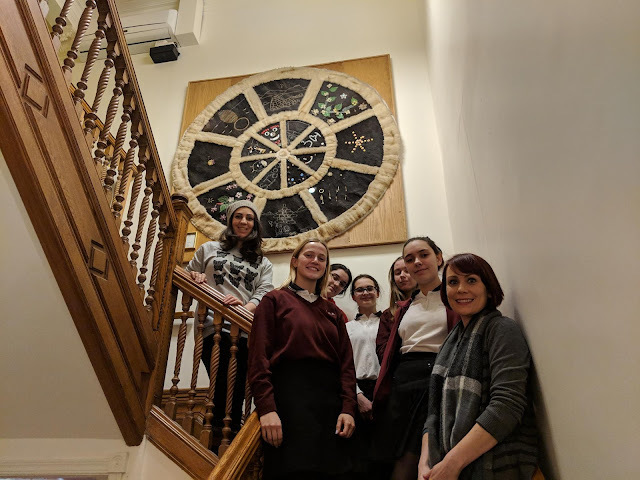 The students of Small Acts/Big Impact were fortunate to receive a tour of Chez Doris on January 18, 2019 and learn about their many contributions to the betterment of women’s lives in Montreal. 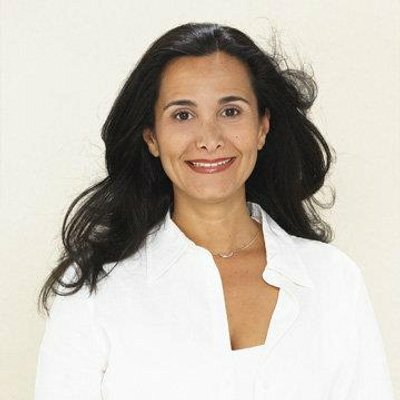 The club is facilitated by Spiritual Care and Guidance and Community Involvement Animator Elizabeth Pellicone and Educator Sunita Fowsar. Photos from the collective project. FACE PARTNERSHIP: It is always nice to see the students working in partnership to create a collective project. 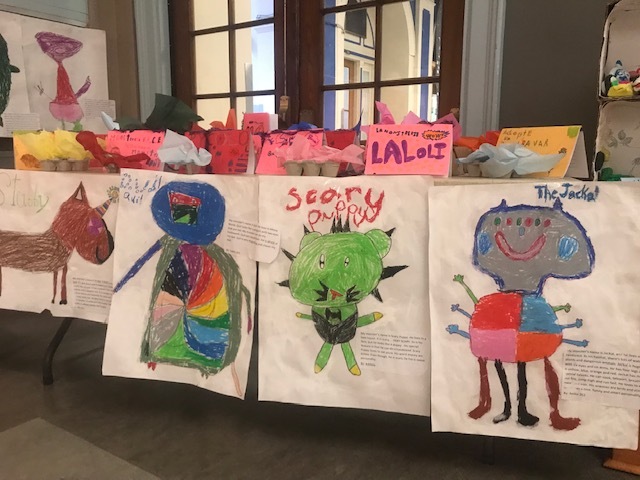 Among others, this year EMSB teacher Jasmine Kuldip and CSDM teacher Veronique Barnwell's created their very own "Monstrerie." The idea was inspired by the books of Elise Gravel, a bilingual Montreal author. The Grade 2 and 3 classes worked together in a true bilingual environment and came up with creative projects. It is now possible that Westmount, the 145-year-old public school where singer-songwriter Leonard Cohen and hockey legend Art Ross also studied, will produce a U.S. president before it produces a Canadian prime minister. Harris returned to her native U.S. for university, and she long ago lost touch with most or all of her Westmount acquaintances. But some of them have traded delighted texts and Facebook posts about her ascent. And they are generally not all that surprised. They remember the California senator, now 54, as an assured, cheery teenager who thrived both in school and on the dance floor. 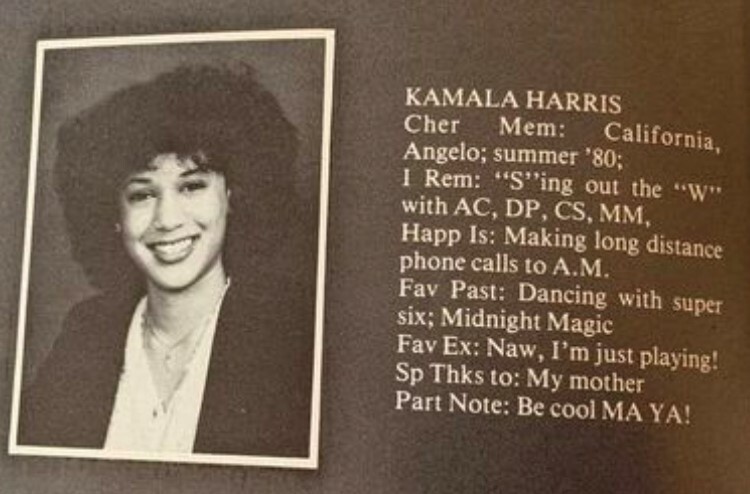 They say she maintained an easy popularity across the subtle divides of a racially and economically diverse student body that drew from both wealthy and lower-income neighbourhoods. GRAND DÉFI PIERRE LAVOIE: The Vehicube of the Grand Défi Pierre Lavoie touched down at Dante Elementary School in St. Leonard recently. 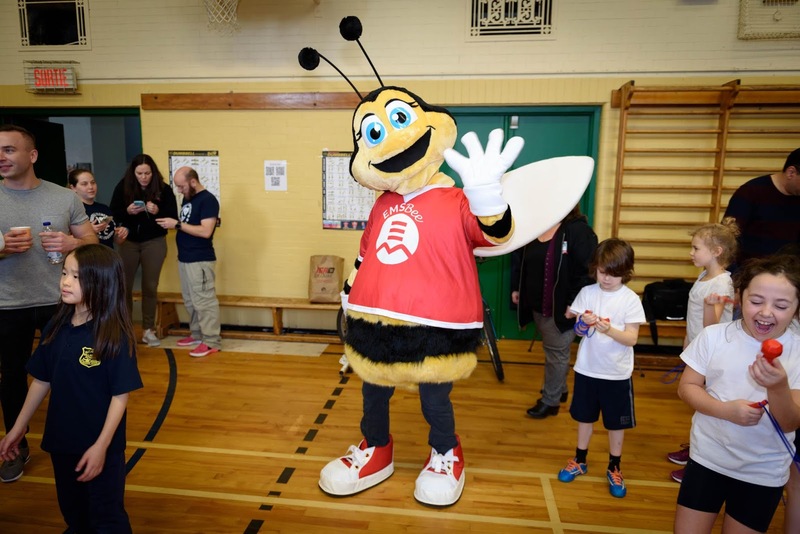 Since November 2008, the tour has been visiting elementary schools in the province to motivate young people to adopt a healthier lifestyle and to enter the friendly contest which takes place in May. A spectacular caravan, the Vehicube is the nerve centre of the operation and a true playground for children. Dante students will take part in the Energy Cubes contest in April. FORMER GUIDANCE COUNSELLOR RELEASES BOOK: Mary Ann Lichacz-Karwatsky released her first book in September 2018, “My Father’s Store and other stories.” Mary Ann started working for the Montreal Catholic School Commission in 1969 and retired in 2008 as a guidance counsellor. She majored in Psychology and Sociology at McGill, holds a Master of Education in Counselling Psychology and also took English Literature courses given by Hugh MacLennan and Louis Dudek who she greatly admired for their fascinating interpretations of poetry and novels. “My Father’s Store and other stories” is a novel captivating the memoire of Mary Ann growing up in Montreal in the post-war-years. Her parents bought the building in 1946 and it was the first store serving a wide variety of customers such as English, French, Ukrainian and Polish. Not only did they sell canned goods and everyday foods, but they also sold pierogis, cold cuts such as kielbasa and Vienna sausages and fresh hot breads from a Polish baker. Mary Ann Karwatsky with son Paul , husband Walter Karwatsky, brother, Peter Lichacz and publisher, Domenic Cusmano. Mary Ann was inspired by growing up in a store filled with colorful characters who often spoke to her as a young child and later in adolescence. As she served customers and helped her parents, she was captivated by the beauty of Rosemount which was a newly unfolding area in Montreal in the 1950’s. The Blue Bird Snack Bar, just under her bedroom window as a teenager, was always filled with students from Rosemount High School dropping in for snacks, local customers and people who got off the cream-colored Beaubien trolley bus whose terminus was right in front of her father’s store. “Remembering the customers laughing as my father told them jokes, especially about the old country speaking in Polish or Ukrainian or English, was like watching a movie every day”, she stated. Working on her novel part-time over several years, she was also inspired by creative writing teachers from the Quebec Writers Federation workshops such as Joel Yanofsky, Elaine Kalman Naves and Taras Grescoe. She currently has a repertoire of stories that she has written over time, but they have yet to be published. She plans to expand and hopefully present a new book. YAD VASHEM SCHOLARSHIPS: Canadian Society for Yad Vashem (CSYV) Holocaust Scholarship Program is designed to educate Canadian educators, from Jewish and non-Jewish schools, and equip them with the right academic tools to teach about the Holocaust. More information can be found at https://yadvashem.ca/csyv-holocaust-scholarship-program/ Applications are being accepted until February 15, 2019. Please contact me with any questions. 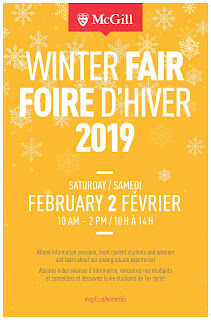 MCGILL WINTER FAIR: McGill University is happy to announce the second edition of the Winter Fair (www.mcgill.ca/winterfair) on Saturday February 2 from 10 am to 2 pm. Parents and students will have the opportunity to meet current students, speak with admission officers, and connect with program advisors. There will also be an admissions overview for high schoolers and faculty specific information sessions for Medicine and Law. 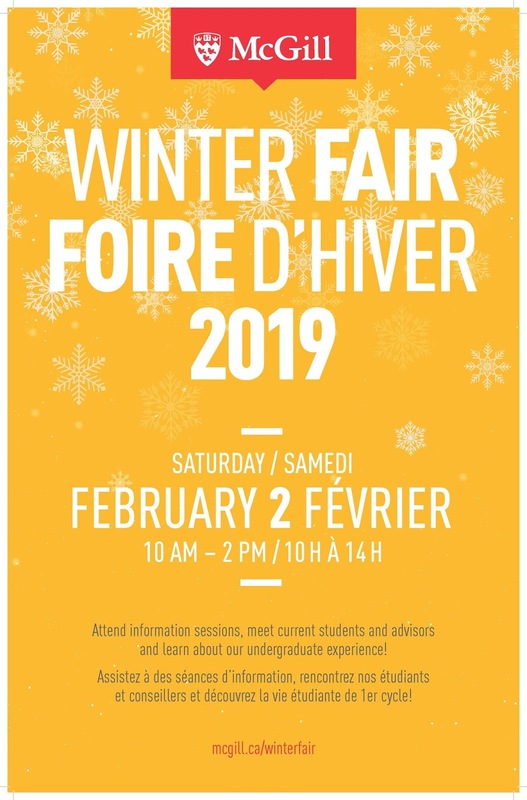 This event is open exclusively to Quebec High School students and CEGEP students and we ask participants to register for the event on the website. STUDENTS GIVE BACK : The Galileo Adult Education Centre’s new School of Sudz welcomed ICI Montreal’s Nick and Silvana to their workshop on January 18, to share their process in making lip balms and scented soaps and candles. The Social Integration Students ( SIS), together with their teachers Miss Lisa and Miss Natalia, named their new sensory project The School of Sudz. 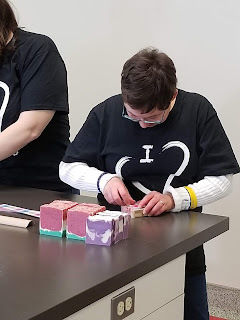 It all began via a soap making class introduced last year and took off without a hitch! The students actively engaged in the different processes from beginning to end. They participate in everything from choosing scents, colors and molds for our soaps, and finally the end product of packaging. The precision in weighing all the oils, pouring the batter of soap into molds, and packaging/sealing the soaps, teaches them valuable work skills. It also promotes self-confidence when they see their end product and what they have accomplished. ICI Montreal was present not only to film the students’ process in making these products, which are made with 100 percent natural oils. They were there to celebrate a special collaboration between Galileo Adult Centre and non-profit group Italiani di Montreal E Amici, which raises funds for the Cedars Cancer Foundation, Giant Steps School and Galileo Adult Centre. After filming SIS students preparing their products, Italiani di Montreal E Amici presented Galileo with a cheque in the amount of $4,000. These funds were raised at a recent Bowling for Autism event and will fund the SIS students visit to a therapeutic horse ranch this coming June. Galileo is grateful for this partnership and is showing their appreciation by giving back to their community. They are preparing beautiful gift baskets that include all of their products. Italiani di Monteral E Amici is selling these baskets for Valentine’s Day. All proceeds will be donated to the Cedars Cancer Foundation. If you would like to purchase a gift basket, call 514-322-1030. LITTÉRATIE PHYSIQUE: À l’aube de la semaine des inscriptions à la maternelle et au primaire (4 au 8 février), la Commission scolaire English-Montréal (CSEM) a présenté ses programmes qui favorisent le développement de la littératie physique. Des invités de marque, des médias et un petit nombre d’élèves provenant de six écoles de la CSEM ont été conviés à l’école primaire Hampstead dans le but d’en apprendre davantage sur la littératie physique grâce à diverses activités et présentations sur ce thème. Hampstead est l’une des écoles primaires ayant joué un rôle de premier plan à ce chapitre. La littératie physique vise à développer les compétences, la confiance en soi et la motivation pour être actif de diverses façons et dans une multitude d’environnements. En développant leur confiance en leurs aptitudes physiques, les élèves améliorent en général leur santé physique, mentale et émotionnelle. L’éducation physique est essentielle au développement de la littératie physique. Dans les classes d’éducation physique, les élèves développent leurs habiletés motrices et les enseignants d’éducation physique structurent soigneusement leurs cours de manière à stimuler la confiance et la motivation, deux composantes clés de la littératie physique. Les bienfaits associés à la pratique régulière d’activités physiques sont déjà bien documentés : maintien de la santé à long terme, accroissement des liens sociaux, amélioration du bien-être mental et physique et meilleure qualité de vie. Or, les enfants qui ont un plus grand savoir-faire physique tirent davantage profit de ces bienfaits, ce qui est essentiel à leur réussite scolaire. La force de la CSEM en matière de littératie physique repose sur quatre piliers : ses solides programmes d’éducation physique et à la santé, son programme qui préconise 60 minutes d’activité physique par jour (fondé sur l’initiative du gouvernement du Québec « À l’école, on bouge! »), sa participation active aux sports interscolaires et sa programmation complémentaire d’activités extérieures et de vie active. La CSEM s’efforce d’aider tous les élèves afin qu’ils réussissent. Pour y parvenir, il importe d’appuyer le développement de la littératie physique par l’entremise de divers programmes. Qui plus est, l’ajout d’activités physiques à l’horaire quotidien de l’école se traduit généralement par une meilleure participation et un plus grand enthousiasme de la part des élèves. INITIATIVE SANTÉ DU GOUVERNEMENT: La CSEM compte désormais 15 écoles primaires ayant choisi de prendre part à l’initiative santé du gouvernement du Québec intitulée « À l'école, on bouge! » L’objectif vise à dynamiser la culture scolaire en s’assurant principalement que les élèves ont la possibilité d’accumuler au moins 60 minutes d’activité physique à l’école, chaque jour. Des habiletés cognitives aux compétences sociales en passant par la santé physique, cette initiative permet aux élèves de tirer avantage d’une foule de bienfaits liés à l’activité physique tout au long de la journée de classe et incite les enseignants à utiliser le mouvement de façon stratégique afin de favoriser l’apprentissage et la gestion de classe. Cette initiative, lancée au cours de l’année scolaire 2017-2018 par le ministère de l'Éducation et de l'Enseignement supérieur (MEES), vise plusieurs écoles de la CSEM qui en sont déjà à leur deuxième année de participation : Elizabeth Ballantyne à Montréal-Ouest, l’école Hampstead, Royal Vale à NDG, Parkdale à Saint-Laurent, St. Raphaël dans Parc-Extension, St. Dorothy à Saint-Michel, Michelangelo et East Hill à RDP, Edward Murphy dans Hochelaga-Maisonneuve et Pierre de Coubertin à Saint-Léonard. Au nombre des nouvelles écoles qui ont adhéré cette année à cette initiative, mentionnons : Leonardo da Vinci à RDP, Edinburgh à Montréal-Ouest, Sinclair Laird dans Parc-Extension, Pierre Elliott Trudeau à Rosemont et Merton à Côte Saint-Luc. La CSEM souhaite étendre ce programme à un plus grand nombre d’écoles. WESTMOUNT PARK: La Commission scolaire English-Montréal (CSEM) relocalisera les élèves de l’école primaire Westmount Park, pendant une période de deux ans, à l’Académie internationale Marymount à NDG et à l’ancienne école primaire St. John Bosco à Ville-Émard. Des travaux majeurs de rénovation seront effectués à l’école primaire Westmount Park. Devant l’ampleur du projet de 12,5 millions de dollars, l’ensemble des élèves et du personnel devront être relocalisés durant les deux prochaines années scolaires, soit 2019-2020 et 2020-2021. L’effectif scolaire qui compte plus de 700 élèves sera réparti entre Marymount et St. John Bosco. Des classes de prématernelle à la 6e année seront offertes aux deux endroits afin d’éviter de séparer les enfants d’une même famille. NOUVELLE ÉCOLE: Le projet de création d’une nouvelle école primaire Français Plus à NDG a été reporté dans le but d’examiner une autre option concernant le bâtiment visé. Devant le débordement des écoles primaires dans l’ouest de son territoire, le comité de planification à long terme de la CSEM avait initialement proposé d’ouvrir une nouvelle école primaire Français Plus au 4850, avenue Coronation à NDG. Les écoles d’immersion surpeuplées dans ce secteur sont Edinburgh (127 pour cent de sa capacité) à Montréal-Ouest, Merton (107 pour cent de sa capacité) à Côte Saint-Luc et Willingdon (90 % de sa capacité) à NDG. Dans le but d’établir cette nouvelle école, la CSEM avait alors recommandé que les effectifs de deux écoles secondaires innovatrices, soit Focus et Outreach, soient relocalisés dans le bâtiment de l’école secondaire James Lyng à Saint-Henri. Cette dernière a conclu un bail avec le Collège Centennial, lequel prendra fin le 30 juin 2019. Le conseil des commissaires a accepté une nouvelle proposition du comité de planification à long terme selon laquelle l’une des écoles surpeuplées (Edinburgh, Merton ou Willingdon) établirait un campus junior (de la prématernelle à la 2e année) dans le bâtiment de l’avenue Coronation de manière à désengorger sur-le-champ l’école en question ainsi que les deux autres écoles aux prises avec le même problème dans ce secteur. Qui plus est, l’école qui installerait son campus junior dans ce bâtiment pourrait également offrir le programme Français Plus. Le premier programme d’immersion Français Plus serait offert de la maternelle à la 4e année (plutôt que de la maternelle à la 2e année) et le programme bilingue (50 % en anglais et 50 % en français) serait offert en 5e et 6e année. Les trois écoles primaires actuellement surpeuplées dans le secteur ouest seront maintenant consultées dans le but de savoir si elles accepteraient ce qui suit : s’implanter sur l’avenue Coronation et ouvrir un campus junior à compter du mois d’août 2019; offrir un programme Français Plus dans leur école au cours des 18 prochains mois; et accueillir le trop-plein d’élèves provenant des deux autres écoles primaires étant donné qu’elle disposerait dorénavant d’un plus grand nombre de salles de classe réparties entre les deux bâtiments. RAPPORT ANNUEL: En vertu de l’article 220 de la Loi sur l’instruction publique, toute commission scolaire doit rendre compte de sa Convention de partenariat dans son rapport annuel. La Convention de partenariat contenue dans le rapport annuel de la CSEM informe la population de son territoire de la réalisation de son plan stratégique et des résultats obtenus en fonction des objectifs mesurables et des cibles que comporte cette convention conclue avec le ministère de l’Éducation le 1er juillet 2010. Le rapport annuel présente au lecteur les cibles et les objectifs fixés, leur raison d’être, les résultats obtenus, l’interprétation de la Commission de même que les rectifications ou les correctifs à apporter à la lumière de ces résultats. Le rapport contribue également à analyser le niveau de réussite des stratégies déployées et leur contribution à la réalisation des objectifs, ce qui permet à la Commission d’identifier les stratégies moins efficaces de manière à les modifier ou les supprimer. Lorsque les progrès ne sont pas à la hauteur des attentes, la Commission revoit ses pratiques éducatives et organisationnelles et détermine les nouvelles stratégies à mettre en place pour accroître le taux de réussite des élèves. La Convention de partenariat est présentée pour la dernière fois cette année. À compter de l’an prochain, la Commission utilisera un format très similaire pour dresser le bilan de son Plan d’engagement vers la réussite. Ce document a officiellement été présenté lors d’une réunion publique tenue le 10 janvier. VÉHICUBE: Le 17 janvier dernier, Le Véhicube du Grand défi Pierre Lavoie est débarqué à l‘école Dante. Le Véhicube fait la tournée des écoles primaires afin de faire vivre une expérience interactive hors du commun aux élèves. Ces derniers apprennent les rudiments d’une saine alimentation pendant l’atelier Manger mieux et pédalent en peloton dans un univers complètement éclaté pendant l’atelier Bouger plus. Les élèves et le personnel de l’école s’en sont donnés à cœur joie lors des différents ateliers présentés par une équipe du tonnerre. « Nous ferons partie du Grand défi des cubes au mois d’avril prochain », a déclaré Elaine Frenette, enseignante. The next Focus newsletter will be published on February 28. The deadline for submissions is February 22.